DONEGAL BAND’S GIG TO BE STREAMED AROUND THE PLANET! 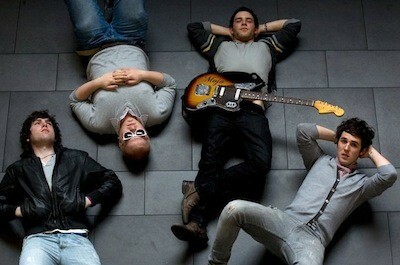 Donegal band Mojo GoGo are set to play a special showcase gig which be will be streamed Worldwide on www.VenueOne.com. The concert, which takes place in The Grand Social in Dublin next Wednesday, december 14th, will run in a Jools Holland Show style and will be presented by 2FM’s legendary broadcaster Dave Fanning. The show is being organised in partnership with the Irish Daily Mail and aims to showcase the best of up and coming Irish talent. Mojo GoGo are giving away 30 FREE tickets to the show on a first come, first served basis. Any fans wishing to attend can e-mail mojogogomusic@gmail.com or visit www.facebook.com/MojoGogo for details. Tickets can be bought on the door for €5.00, from which all proceeds go to FOCUS Ireland. Mojo GoGo are Donegal natives who formed in Derry in November 2010. In February 2011, they recorded “The Rounce EP”. It was described as “Simple, clean, packed with fantastic, thick melodies and hooks” by Goldenplec with “hair standing choruses”. Having toured incessantly over the next few months, Mojo GoGo holed themselves up in their native Donegal to write for their next release – “Cheats, Chicks and Powders EP” which they recorded with Frank Kearns of SALT Studios, Dublin in July 2011. Since then, Mojo GoGo have gone on to play some of the country’s most prestigious venues such as The Ulster Hall, Roisin Dubh and Whelan’s with international acts such as Ash, The Enemy,The Minutes and Horslips to name but a few.